Greetings all! As I did last year, I'm going to make separate posts each day for the Tour de France... that way you can read them after you've watched the stage on your Tivo (! ), or ignore them entirely if you are so inclined. These posts contain my commentary; for complete reports I suggest the Tour de France website and Velonews and CyclingNews. The Tour got off to a great start today with a prologue in Rotterdam, the Netherlands, a country already buzzing with sport after the Oranje defeated Brazil in the World Cup yesterday. 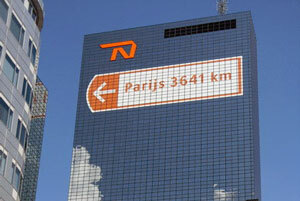 The 9km ITT was flat as a pancake, with the two "climbs" corresponding to two bridges over Rotterdam harbor. The intrigue of the day was whither the weather; some competitors opted to start earlier in their team's allotted slots, betting that the forecast rain would come later in the day, but in the event the rain came early, favoring the favorites as the roads dried out toward the end. To nobody's surprise Fabian Cancellara blistered the course to wear the first yellow jersey. Tony Martin finished second, and David Millar third, but the news of the day was Lance Armstrong finishing a strong fourth, just 2s behind Millar at +22, besting Alberto Contador who finished sixth, 5s behind Lance at +27. Early days yet but crucial to the psychology as Lance will be delighted to find himself ahead of Alberto. Others putting in good rides included Levi Leipheimer (8s behind Millar at +28), Michael Rogers (+35s), and Andreas Kloden (+36). Meanwhile Cadel Evans is probably disappointed with his ride (+39) as is George Hincapie (+54), and Ivan Basso cannot be happy with his (+55) nor can Frank Schleck (+57) or his brother Andy Schleck (+69). And Denis Menchov (go Rabobank!) had a crummy start with +56. Tomorrow is a stage for the sprinters - the GC guys will just try to avoid crashing - stay tuned as we find out if Mark Cavendish is going to dominate the flats again! Fortunately nobody was seriously hurt - although scrapes and bruises now can take a toll three weeks later - and everyone in the field received the same time. Well today was as weird a day in the Tour de France as you could ever hope to see. Rain exacerbated by gasoline from a crashed motorcycle resulted in a slippery descent on the backside of the penultimate climb, and caused a large number of crashes... the peloton called an informal halt to racing, and finished as a pack. Meanwhile Sylvain Chavanel escaped in the early break and stayed out all day, getting the victory as well as three minutes on the entire field, putting him in yellow and green! Fabian Cancellara was in yellow and was driving the peloton toward Chavanel when he heard that his teammates Andy and Frank Schleck had crashed hard. He throttled back and convinced the rest of the peloton to do likewise, enabling most of the crashees to rejoin, whereupon it crossed the finish en mas at a leisurely pace. My own view is that while Cancellara did the right thing for his teammates, the peloton was under no obligation to stop; rain, slippery roads, crashes, and so on are part of bike racing, and it is what it is. I'm honestly surprised some of the sprinters didn't race it out for second. I've read that the officials have neuralized all the points for the peloton after Chavanel, which makes sense given the way they didn't race, but if ten guys had sprinted for the finish, surely they would have been awarded points also? How very weird. Tomorrow we have the infamous stage 3 over cobblestones; doubtless there will be those who fall, and those who have mechanicals, and so on; let's hope the peloton race it out! Today was the big day - cobblestones! And while some riders did in fact wipe out - Franck Schleck broke his collarbone and had to withdraw - overall it was a good racing day. Thor Hushovd exorcized the frustration of not being able to sprint yesterday (after the peloton decided to go easy) by blasting out front to take the stage and the green jersey, and Sylvain Chavanel suffered several untimely mechanicals and relinquished the yellow jersey back to Fabian Cancellara. The real battle among the GC contenders was pretty interesting; Cadel Evans had a great day, and now leads among those considered capable of winning the GC, and Alberto Contador had a good day too, not only surviving but picking up time on Lance Armstrong and Ivan Basso. Cancellara paced Andy Schleck to a strong finish, and Alexander Vinokourov had a strong day, leading out Contador and ending up high up on GC himself. Wow! 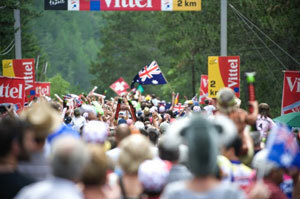 A quiet day in the Tour de France; 200km of parade followed by 200m of sprinting! To the surprise of many Mark Cavendish did not win, in fact he didn't even place in the top ten, instead Alessandro Petacchi won another sprint, this time without the benefit of any crashes eliminating his competition. The usual suspects fought it out, including Thor Hushovd who seems to be Petacchi's main competitor for the green jersey. Meanwhile it was all quiet on the GC front as the peloton took the opportunity to relax and heal. Tomorrow is another field sprint - it will be interesting to see if Cavendish becomes a factor. To everyone's relief, especially his, Mark Cavendish finally opened his account in the 2010 Tour with a convincing sprint win, besting rivals Thor Hushovd, Alessandro Petacchi, Robbie McEwen, and Tyler Farrar. It was noticeable that HTC waited longer to get their "train" rolling today, and Mark Renshaw had the perfect lead-out setting up the win. Speaking of tomorrow, I won't be able to watch as I will be otherwise occupied, but it should setup nicely for a breakaway win, with just enough climbing to effect a selection, but not enough to tempt the GC men to try anything, especially with a really serious mountain stage on offer Sunday. Cheers and see you Sunday! 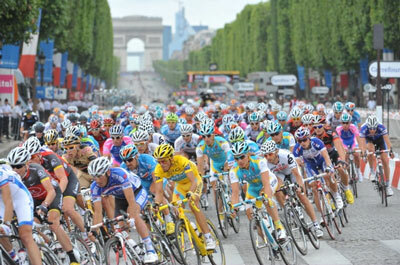 Just finished watching today's TDF stage while driving back from the Death Ride; it was pretty entertaining, wasn't it? There was just enough climbing to make things interesting and provide opportunities, but the climbs weren't steep enough (or long enough) to provide the GC men with opportunities to gain time. Jerome Pinot used the stage as a chance to escape and take points for the polka-dot climbers jersey - chapeau to him, nicely done - and Sylvain Chavanel attacked on the final climb and took time on everyone to win and get the yellow jersey back - chapeau to him, very nicely done. After that weird stage 2 where Chavanel won from the early break while the rest of the peloton stopped racing, we all thought he would have the yellow jersey all week. 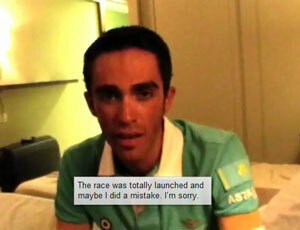 But then he had tons of bike trouble in stage 3 over the cobblestones, and so he lost it the next day. But now he has it back, for one more day at least. Tomorrow morning the Tour really starts; stage 8 is serious alpine climbing, with two big category 1 climbs at the end including a mountaintop finish, and we should see a significant selection among the GC men. Will Lance be able to do it? Will Contador stamp his authority on the peloton? Will Andy Schleck gain back time? What about Evans? And Menchov? And Wiggins? And... Can't wait! Lance Armstrong has seen many great days in the Tour de France, but now he's seen a horrible one too, as he crashed three times, bonked, and lost over 12 minutes on GC today. He's out of the running now, and I'm sad. Even though it was improbable that he could win again the stacked field this year, the drama of having him in there duking it out was excellent. Meanwhile the first real mountains of the 2010 Tour provided the second real selection (the first was on the cobblestones in stage 3). The final 30 miles featured two Cat 1 climbs separated by a Cat 3, and the peloton was driven by Astana to shed everyone who wasn't a serious contender (including Sylvain Chavanel, who did his best in yellow to hang in there). Finally there was just a few elite men left, and bam Robert Gesink attacked! Contador marked him, probably using up his reserves, because later when Samual Sanchez attacked only Andy Schleck could go with him. 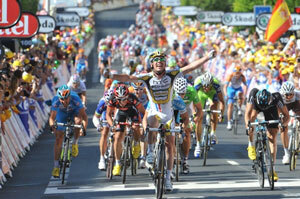 The result was a win for Schleck which left Cadel Evans in yellow. (As he noted, it's a special day when you can swap the rainbow jersey [emblematic of the world champion] for the Tour's yellow.) Other contenders still in the mix included Schleck (0:20), Contador (1:01), Denis Menchov (1:10, a great place for him), and Levi Leipheimer (2:14, now the Radio Shack leader, one would think). Sandy Casar survived to win the stage and Schleck took over the yellow jersey, by 41s. It is now evident that either Schleck or Contador are going to win, and there is a four-way battle for third between Samuel Sanchez, Denis Menchov (go Rabobank! ), Jurgen Van Den Broek, and Levi Leipheimer (go Shack!). Tomorrow seems to be one of those transitional stages with enough climbing to prevent a field sprint but not enough to have a GC shootout; could be a "breakaway" stage. But nothing has been normal in this year's Tour, so stay tuned! Today's TDF stage was forecast to be good for a breakaway, and it was, as Sergio Paulinho outlasted a long break to give Radio Shack something to cheer about. Behind him the peloton took a much needed rest, as both the GC men and the sprinters hung back to wait for another day. It was Bastille Day so you might have expected French riders to push for victory, but in the end it was Portugal (Paulinho) against Russia (Vasil Kiryienka). (Yawn) 185km of riding, an early break, swept up, and then 500m of furious sprinting, resulting in another Cavendish victory. The sprint itself was kind of interesting, with Cavendish's HTC teammates mixing it up with Tyler Farrar's Garmin team and Alessandro Petacchi's Lampre boys; in the end HTC's #1 leadout rider Mark Renshaw was disqualified for unsportsmanlike riding. The replays seemed to indicate it was a fair decision, as he head-butted one rider and nearly drove another into the barriers. When the dust had settled Petacchi gained enough points to tie Thor Hushovd overall, taking the green jersey by virtue of his two stage wins. It is certainly an interesting competition among the sprinters. Tomorrow is a rather interesting stage; some Cat 2 climbs and a lot of rollers, with a really steep short climb up to the finish. It seems like a day for a break, with some climbers fighting it out to the finish, but there could be a battle between the GC contenders at the front of the main field, too. We'll see! Today's stage really lived up to its potential. A huge 18-man break escaped early, with GC contenders Ryder Hesjedal, Alexander Vinokourov, and Andreas Kloden included. That ensured a long hard day for the peloton as Saxo Bank and Lampre tried to keep the break within reach. All were aware of the sharp steep finishing climb waiting at the end. Predictably the break itself was attacked, with Hesjedal, Vino, Kloden, and Vasil Kiryienka escaping off the front, putting even more pressure on the peloton. On the brutal final climb Hesjedal was cracked almost immediately, followed by Kloden, and Vino battled Kiryienka halfway up the climb before shedding him, seemingly on his way to a stage win. Meanwhile the peloton surged up the climb and exploded, spitting out also rans to the back as a back of serious contenders formed in front, grinding up the remnants of the break in the process. And then - Joaquin Rodriguez attacked! and Alberto Contador went with him! and Andy Schleck was left to try to answer. Contador and Rodriquez flew up the hill, passing everyone including Vino at the very end, and Rodriquez out-kicked Contador for the victory. Schleck recovered and gained some time back, eventually limiting his losses to 10s, but it was a moral victory for Contador. The other GC contenders were close but there were a few time gaps, and Levi Leipheimer in particular lost a little in the battle for third place. It was a great race and man was that a nasty climb at the end. Whew! Oh, and another cool thing? Thor Hushovd made that 18-man break and took sprint points all along the route to regain the green jersey; the wily veteran always seems to do this once or twice a tour. It was beautiful to see him driving the break up those mountain stages. After the last sprint he threw out the anchor; job done for the day. On a day which would seem to belong to the sprinters, a transitional stage with few climbs and lots of rollers, Alexander Vinokourov attacked at the end and won, following his near-miss yesterday. I think we were all pulling for him, it was a great victory; he had to burn some serious watts to hold off the charging peloton at the end. Mark Cavendish won the field sprint for 2nd, and Alexander Petacchi finished 3rd, putting enough points on Thor Hushovd to reclaim the green jersey. The overall GC was unchanged as the climbers rested up for tomorrow's serious tour of the Pyrenees. Speaking of tomorrow; near the end we have the HC Port de Pailhères to soften up the field followed immediately by a mountaintop finish on the Cat 1 Ax-3 Domaines. A real mountain stage and we should see some interesting racing! Wow, what a shootout! A *great* mountain stage today, featuring the world's nastiest HC Port Port de Pailhères, 10 miles of climbing at 8%, followed by a steep descent and then the Cat 1 Ax-3 Domaines to a mountaintop finish, 6 more miles of 8%. Wow. Chapeau to Christophe Riblon who survived all the way from the early break, which had about 5 minutes at the base of the Pailheres. From there steady pressure by Astana splintered the peloton, with various amazing attacks - Carlos Sastre took off, among others - and there were only GC contenders left by the top of the climb. The descent was uneventful, and on the final climb Contador and Schleck marked each other, leaving Denis Menchov and Samuel Sanchez free to take off and engage in their battle for third. Jurgen Van Den Broek lost a little time - he's still in fifth, but barely - and Levi Leipheimer lost a little more time, sinking to seventh, his chances at the third podium spot diminished. All in all it was an exciting bike race, and we can only look forward to three more stages in the Pyrenees. Tomorrow we have more climbing including the HC Port de Bales, but there's a considerable descent from the last climb to the finish, so it could be interesting. Seems like Contador is content to hang with Schleck, feeling that he has an advantage in the final time trial, and Schleck is content to hang with Contador, with the yellow jersey on his back. Either might attack tomorrow however; it has been a great, unpredictable tour so far, and there is much riding left. Wow, Lance *almost* pulled it off, and I think everyone was pulling for him to do it. He almost won from a nine-man break, almost putting a great punctuation mark on his fabulous Tour de France career. At least he gave it a shot! But it was not to be. A nine-man break formed, with no GC contenders, and they made it all the way to the finish, but Pierrick Fedrigo out sprinted the rest of the break, leaving Lance to finish sixth. I was a little sad but it was fun watching it all unfold however :) Also great on this day: Thor Hushovd does what he always does, race his bike in the mountains as well as the flats, and as a result he took enough sprint points to reclaim the green jersey from Alessandro Petacchi. We'll see if he can keep it, but it is cool that he can compete for the green jersey without actually being one of the top sprinters. Tomorrow is a rest day - much needed, you can be sure - and the day after we'll have fireworks for sure as it will be Andy Schleck against Alberto Contador mano-a-mano on the hilltop finish to the Tourmalet, which they'll climb from the other side to the way they took it today. Will be amazing! Today featured the ultimate mountain battle - three amazing climbs culminating in a mountaintop finish on the HC Col du Tourmalet - and Andy Schleck and Alberto Contador fought to a draw, with Schleck winning the stage (by about a wheel) and Contador keeping the yellow jersey. After the usual break took off - doomed, as everyone knew, because the GC contenders would fight it out on the final climb - the peloton settled in and cruised over the first couple of Cat 1 climbs, descended into the valley, and then the hostilities began. 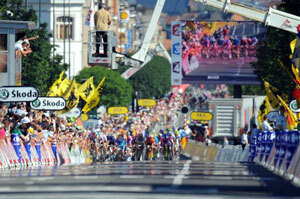 Schleck's Saxobank team put down the hammer, and ground down the peloton to a small group of elite riders. At that point Schleck attacked, and only Contador could stay with him. They rode as hard as two guys can ride all the way up the steep climb, each attacking the other, and neither gave an inch. In the end Schleck won, but you could see Contador could have sprinted for the line, but choose not to... he kept his yellow jersey (by 8s), and most observers believe he'll open the gap substantially in Saturday's time trial. It was great to watch. A cool side note: after the break formed Carlos Sastre attacked, and he stayed out most of the day until he was caught midway up the final climb. Good for him; it didn't work, but it was great to see him try it. Today was the traditional "penultimate day time trial", and the flat course through the Bordeaux wine vineyards provided plenty of drama. The competitors ride in reverse order of their standing on GC, so Fabian Cancellara went early, smashed the course before the wind came up, and then spent all day watching other riders try unsuccessfully to beat his time. Tony Martin was second (another early rider). Later in the day the GC contenders fought it out; Denis Menchov had a great ride in the increasing wind to take over third from Samuel Sanchez. And Andy Schleck went out fast - wow! - nearly was the leader on the road, but ultimately Alberto Contador prevailed and ended up consolidating his lead in the yellow jersey. The Radio Shack boys didn't fare too well - Lance Armstrong, Levi Leipheimer, Andreas Kloden, and Chris Horner, but they still added to their team's overall lead and will end up on the podium tomorrow. Tomorrow we'll have the usual parade to Paris and bunch sprint, with the extra drama that the green jersey is still up for grabs; Alessandro Petacchi has it now, but Thor Hushovd and Mark Cavendish both have a shot at it. One more day! The main excitement of the day occured before the start; Team Radio Shack unveiled their cool new "28" jerseys, all black (memo to self: get one!) only to be informed that they would be disqualified if they didn't switch back. Boo. So we were treated to the sight of nine riders sitting by the side of the road, pinning their numbers onto new jerseys, while the peloton soft pedaled through the neutral zone. Pretty funny. Later the team showed off their new jerseys while being presented as the top team in the 2010 Tour (pic at right). It is fitting that Lance Armstrong's team won, in his final Tour; he has always been about the team, and he came back to cycling to promote Livestrong, his "team" to fight cancer. Chapeau, Lance! The final podium featured Alberto Contador winning his third tour, Andy Schleck with his second consecutive second, and Denis Menchov, who has won the Vuelta twice and the Giro, and has now been on the podium of the Tour. It was a great Tour - the best really since I began paying attention, in terms of the competition and the route and all the side stories - and I'm sad it is over. More perspective in a future post, but au reviour Le Tour for now. reliving an amazingly great Tour de France! Well it was a great tour, an *amazingly* great tour, and now it's over, and like always at the end of July, now I'm sad. No more getting up early to watch Phil and Paul and Bob and Craig, no more watching 200 lycra-clad athletes ride bikes around France, surrounded by the most amazing scenery as the climb the Alps and the Pyrenees, and fly through little villages, and pass through big cities brought to a standstill by their passing. Not until next year anyway. Fabian Cancellara dominating the Prologue in Rotterdam. How great was he, and how great was it to have the Prologue there, and how significant was the Prologue, as the time gaps in that 7 mile race determined the winner three weeks and 2,100 miles later. 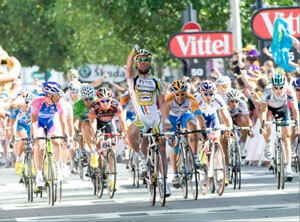 Alessandro Petacchi winning stage 1 in Belgium. Who? Oh yeah, him, only one of the best sprinters ever, and we all thought it would be between Mark Cavendish and Tyler Farrar. Thus was heralded one of the best green jersey competitions in recent memory. That weird standstill in stage 2, wherein the entire peloton except race winner Sylvain Chavanel finished together in the same time, at the behest of Fabian Cancellara. Sure there were a lot of crashes but neutralize the whole race? It sure hurt Thor Hushovd, and it sure helped Andy Schleck. And then - dum dum dum - we had stage 3, the cobblestone stage! Won by Thor Hushovd, to his everlasting credit. And Alberto Contador did just fine, thank you, and Andy Schleck did too (by following in the wake of Fabian Cancellara). But Frank Schleck broke his collarbone, ending his tour, and perhaps fatally hurting teammate and brother Andy's chances for the overall victory. 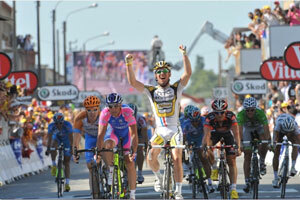 Forward to stage 5, as Mark Cavendish tearfully blazed to victory, after Petacchi had claimed stage 4. The Manx Missile was back, and took stage 6 too, for good measure. Stage 7 was cool as Sylvain Chavanel attacked on the final climb and ran away to victory, claiming the yellow jersey and the hearts of French cycling fans everywhere. And then stage 8, that fateful stage, the first "real" climb in the Alps. Lance Armstrong crashed three times and lost 12 minutes, eliminating his chance to win. Meanwhile Andy Schleck took time on everyone and won, leaving Cadel Evans in yellow. And then Stage 9 saw another contender eliminated as Cadel Evans broke his elbow and lost big time. Schleck and Contador put time into all the GC contenders as it became obvious one of them would win the tour. Stage 12 was a doozy, the final Alpine stage; a huge break boiled down to Alexander Vinokourov attacking up the final climb, only to be caught by Contador, who attacked the GC peloton and put 10s into Schleck to win the stage. Fireworks! Also cool on this day was watching Hushovd lumber up the climbs to take sprint points and claim the green jersey. 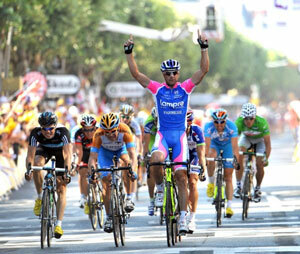 And Vino attacked the sprinters the following day to win stage 13. The Tour moved into the Pyrenees, and stage 14 was another great shootout. Contador and Schleck battled to a standstill, while Denis Menchov and Samuel Sanchez fought a battle of their own for third place. Probably the stage most people will remember best? 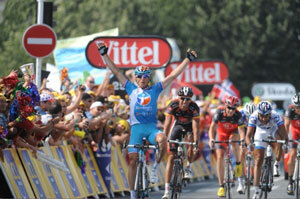 Stage 15, another mountain battle; Thomas Voeckler won (! 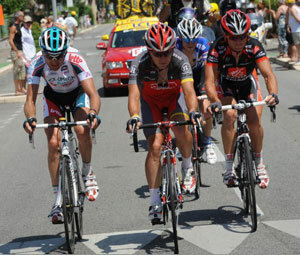 ), but Schleck attacked and was pulling time on the GC group when his chain came off! Whoa. Contador wasted no time blowing past, and by the time the dust settled he had taken 40s from Schleck, as well as the yellow jersey (for good, as it turned out). Stage 16 looked like a chance for a breakaway, and so it was, but the amazing news was that Lance Armstrong himself attacked and led the race solo for a while, before a nine-man break formed. He gave it his best shot and we were all rooting for him to win, but he was out-sprinted in the end. If you ever want to see an epic battle on a mountaintop finish, check out stage 17, in which Schleck did everything he could to attack Contador and take time, and nearly did, but then didn't; he did win, but Contador was half a wheel behind. It was awesome cycling. And meanwhile Menchov and Sanchez pulled away and drew in their competition for third. 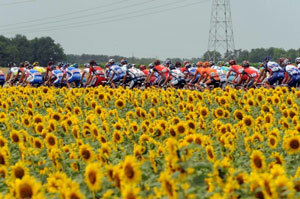 The final GC battle was the ITT, as usual, stage 19 through the vineyards of Bordeaux. Cancellara won, to noone's surprise (and his delight and relief), while Menchov posted the best time among the GC contenders, blasting away from Sanchez to secure third. And Andy did the ride of his life to challenge Alberto, but just couldn't do it; a noble effort that fell just short, leaving Contador the overall victor by 40s. And the final sprint battle was the final stage, as usual, the parade up and down the Champs Elysees; Cavendish blew out to win, his fifth of the tour, and Petacchi finished second to end up as the sprint champion. Adding spice; the Team Radio Shack "28" jersey stunt (which raised the UCI's ire), as they won the team competition, putting Lance back on the podium as a winner in his last Tour.